Arnica remains a very mysterious plant. Still not commonly used in America, this plant with the yellow flower is however of a formidable efficiency when it comes to treating a multitude of ailments. Arnica is available in over 30 species. 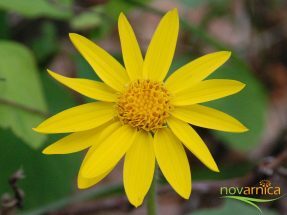 Arnica montana or mountain arnica, used in Novarnica products, is native to the mountainous regions of Europe (Romania and Spain are the main producers). It started to be used in the era of ancient Greece and some clues even suggest that its virtues have been exploited since prehistoric times. Up to now, it has been the subject of numerous studies conducted by both ESCOP and the E Commission, which have recognized its effectiveness and approved its use in the treatment of several conditions. Prized for its benefits, many European laws try to preserve this miraculous plant from undergoing highly intensive agriculture. Arnica montana is usually 20 to 30 cm tall and grows in mountainous areas in acidic and nutrient-poor soils. It is part of the Asteraceae family (large plant family). It is harvested in the wild at the beginning of the flowering period from May to June. It is the flower, the entire flower head (Arnicae flos), which is used for its active ingredients in product formulations. While it is inadvisable to ingest the plant because of its toxicity, arnica, in a topical form as provided by Novarnica, instantly relieves arthritis, osteoarthritis, lumbago, joint pain, sore muscles, body aches, sprains and injuries sports by reducing inflammation. It is also the most commonly used plant to treat trauma. 100% natural, most arnica-based products such as ours, are without contraindication when used externally. Arnica is safe for everyone (we recommend that you consult a health care professional when taking medications or a particular medical condition). Arnica is an asset to any medicine cabinet and reaching for Novarnica should become an automatic reaction in case of a sports injury, a blow causing bruises or pain due to inflammation! Did you know of the healing properties of arnica?